Since World War II, the U.S. government has been involved in numerous wars and orchestrated coups in more than fifty countries based on fabricated lies created mainly by the CIA to destroy or remove governments not subservient to Washington’s interests. Goebbels knew that “the lie can be maintained only for such time.” And time and time again, the mainstream-media (MSM) has been exposed as an agent of propaganda. For example, at the start of the Vietnam War, the U.S. government was supplying the MSM with information on the Gulf of Tonkin incident and they accepted it without question. On August 5th, 1964, The Washington Post headlined ‘American Planes Hit North Vietnam After Second Attack on Our Destroyers; Move Taken to Halt New Aggression.’ Other MSM sources followed with similar headlines. Washington’s official story was that on August 2nd, the North Vietnamese torpedo boats launched an “unprovoked attack” against the U.S. destroyer Maddox that was supposedly on a routine patrol in the Gulf of Tonkin. Two days later, another so-called “deliberate attack” was committed by North Vietnamese PT boats. All the claims by the U.S. government and the MSM were based on lies. In fact, the U.S. destroyer Maddox was engaged in an intelligence-gathering mission that also helped coordinate attacks with the South Vietnamese navy and the Laotian air force against the North Vietnamese forces. The result of the lie ended with more than 50,000 U.S. deaths and millions of Vietnamese casualties. According to the Vietnam Red Cross, over 3 million Vietnamese including 150,000 children were affected with Agent Orange chemicals sprayed on the countryside by the U.S. Air Force to eliminate forest cover for North Vietnamese and the Viet Cong troops since the war ended in 1975. Agent Orange was also used to destroy crops that were meant to feed the Viet Cong. Numerous books had been published on the lies that led to the Vietnam War. One of the books, ‘The Uncensored War: The Media and Vietnam’ by Daniel Hallin who said journalists had “a great deal of information available which contradicted the official account [of Tonkin Gulf events]; it simply wasn’t used” Hallin claimed. The lies perpetrated by MSM are a component of the Military-Industrial Complex. The MSM is a public relations firm that represents the establishment’s hidden agenda disguised as a noble cause to spread “American style democracy”to the rest of the world. The war in Iraq with the “Weapons of Mass Destruction” hoax with help from The New York Times also convinced the public to support the Bush administration’s Neocon agenda to remove Saddam Hussein. The American public fell for another lie and what was the outcome? A disastrous war that left Iraq permanently fragmented. The Iraq war created more terrorist networks that happen to be supported by the U.S. government and its allies ready to destroy other sovereign nations in the Middle East including Syria. The Iraq war also created a refugee crisis and impoverished Iraqi society for future generations. What does she mean by real world consequences? Does she mean the war she waged on Libya by the US-NATO alliance during her time as Secretary of State under the Obama administration that caused the deaths of thousands of people and displaced millions more who is now flooding the shores of the European Union? Or does she mean the total destruction of one of the wealthiest nations in North Africa that was economically independent with its own money, its own water resources, its own oil reserves and even its own central bank? ¬Speaking on March 31, Bishop Giovanni Innocenzo Martinelli, Apostolic Vicar of Tripoli, reported that “the so-called humanitarian air raids have taken the lives of dozens of civilians in various areas of Tripoli.” The senior cleric went on to say “in the district of Buslim, a building collapsed because of the bombing, killing 40 people,” as cited by Agenzia Fedes, the information service of the Pontifical Mission Societies. However, despite the decision to turn a blind eye to the casualty figures, one of the few instances the alliance could not deny culpability in was a June 19 NATO missile strike that resulted in the deaths of nine civilians. On April 2, 2011 sources with access to advisors to Saif al-Islam Qaddafi stated in strictest confidence that while the freezing of Libya’s foreign bank accounts presents Muammar Qaddafi with serious challenges, his ability to equip and maintain his armed forces and intelligence services remains intact. According to sensitive information available to this these individuals, Qaddafi’s government holds 143 tons of gold, and a similar amount in silver. During late March, 2011 these stocks were moved to SABHA (south west in the direction of the Libyan border with Niger and Chad); taken from the vaults of the Libyan Central Bank in Tripoli. The truth to the matter regarding what Hillary Clinton said about “real-world consequences” regarding social media and the onslaught of fake news is ludicrous. It was Clinton’s lies that led to the death of Libyan President Muammar Gaddafi and the total destruction of Libya, not the alternative media. The MSM is exposed. They lost control of the narrative. 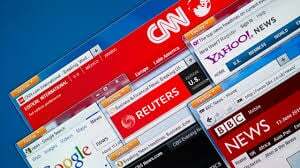 The alternative media is growing with an array of independent news organizations, websites, bloggers, citizen journalists and a public that is sick and tired of the lies who just want the truth. If they (Western governments including the U.S.) were to manage to censor the alternative media which will be difficult to do, there will be other ways to inform the public. Remember the printing press? Then again, the MSM will be in a full-blown panic as their newspaper sales continue to plummet. Viewership for the MSM on basic television and cable has declined dramatically thanks to the internet. One other important note to consider, instead of being objective, the MSM, particularly in the U.S. had sided with Hillary Clinton over Donald Trump during the elections, since then, it all has been downhill for the MSM. No one can trust the MSM and they never should. Welcome to the alternative world where once, the dinosaur media roamed the earth and are now are going extinct, a new breed of journalism and the quest for truth is here to stay. Throughout my life, people always told me that we can never change the world because it is filled with evil people that will do anything to remain in power even if it means lying to the public. That may be true to a point, but I don’t believe that we as a people cannot change the course of history because the ruling elites from past imperial powers to the present American Empire have always lied to the people to advance their agendas, now we are turning the tide. I have hope in humanity because the truth is the foundation of humanity. My friends, it’s up to us, the people, to tell the truth to power because the lies perpetrated by the MSM have led the world to endless wars, poverty and a self-absorbed society based on useless consumption. The cadre of MSM organizations and personalities including losers like former NBC Nightly news host Brian Williams (who is laughably in the battle against “fake news”), Hillary Clinton, ABC, CBS, The New York Times, The Washington Post, PBS, NPR, The BBC, The Los Angeles Times, The Chicago Tribune and others are fighting for their survival. The alternative media is now the enemy. “Fake news” accusations against the alternative media are the only weapon they have as the establishment and their MSM minions move forward in an attempt to censor the “real news.” The ghost of Joseph Goebbels whispers in the ears of the establishment and that is for them to “use all of its powers to repress dissent.” It will be an epic failure because the truth always finds its way.